fav food? 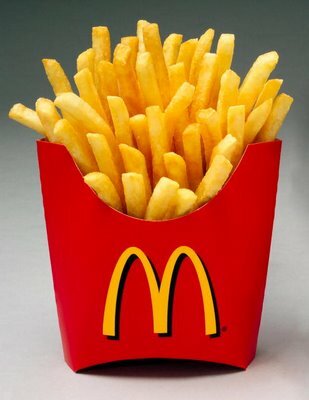 actually i do have lot fav food ( im kinda a carnivora, i reckon :D) but most of all, McD french fries is on number 1. Why french fries? Actually im a potato lover. i love all kind of food that made from potato, from mashed potato tp perkedel, you say it, i love it all. I even like it more better than rice, my staple food. I dont know why, it just comes that way. Why McD? well, in my personnaly taste, McD has the best french fries compare than any junk foods, of course i love patat ( potato fries on dutch way ), but McD has a long history on my childhood. I used to go to McD every Sunday ( while McD just started invanded Jakarta) and maybe i just brain washed by my parents who always said to me, " The best french fries is the one that McD has". Well, maybe. The other fact of me, potato is always my comfort food. I always get it when I upset down, and it could brings me the feeling safe and home that i really need to have. Well, after writting this, i feel hungry. Where's my food?